The book Hlasy dvou básníků [Voices of Two Poets] is a selection from the works of Iurii Darahan and Oleksa Stefanovych – two Ukrainian poets who came to Czechoslovakia in the 1920s after failed attempts to create an independent Ukrainian state. They found a new home in Prague and established themselves there as writers. Both are included in the ‘Prague School’ of Ukrainian poets in exile. The publication builds on previous editions dedicated to poets of the ‘Prague School’. Iurii Darahan (1894–1926) is represented by less than half of the poems from the collection Sahaidak [Quiver], mostly natural lyrics, with historical poetry being slightly less frequent. Translations have been made from the first edition of the book: Sahaidak (Prague, 1925). Oleksa Stefanovych (1899–1970) is presented through a selection of the most distinctive areas of his poetry: mostly historical, complemented by natural and love lyrics. The translations have been made based on the edition Poety Prazkoii shkoly: Sbirni surmy. Antolohiia (Kiev, 2009). The anthology has been compiled by Tereza Chlaňová and Alena Morávková; the poetry has been translated by Tereza Chlaňová, Matěj Lipavský, Alena Morávková and Václav Daněk. The publication has been issued by the National Library of the Czech Republic – Slavonic Library and the Czech Association of Ukrainists with the financial support of the Ministry of Foreign Affairs of Ukraine. 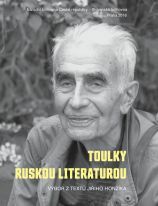 The book Toulky ruskou literaturou [Wandering through the Russian Literature] brings a selection of texts on the Russian literature from the pen of a significant Czech Russian Studies expert, literary scholar, translator and poet, doc. Jiří Honzík (1924–2018). It is a cross-section of the author’s professional work, focused on texts that are little known or not easily accessible as well as on those that have not been published yet. Most of previously published texts have been reworked and revised by their author. The larger part of the volume is thematically associated with the issues of the Silver Age of Russian literature, the theme of Honzík’s life, but the author has also selected texts dealing with an earlier period (the work of A. S. Pushkin) as well as more recent (the production of A. I. Solzhenitsyn). The distribution of the book is provided, besides the Slavonic Library, by the online bookshop Kosmas.cz. The book publishes the scientific papers presented by the participants in the international conference ‘The Law of Decay Resistance: Special Features of Varlam Shalamov’s Prose and Poetry and Their Perception at the Beginning of the 21st Century’, which was held in Prague on 17–19 September 2013. In their texts, the authors have revealed new aspects of the life and work of the Russian writer and poet Varlam Tikhonovich Shalamov (1907–1982), dealing with both his prosaic works and the analysis of his poetry. A separate panel was devoted to the issues of the translation of Shalamov’s texts into different world languages and the methodology of their translation. In comparison with other conferences on V. T. Shalamov, these texts emphasised the ethical issues in his work, with attention logically being drawn to Shalamov’s specific poetry. The book is complemented by twenty previously unpublished poems by Varlam Shalamov newly discovered in the author’s literary estate deposited in the Russian State Archive of Literature and Art in Moscow. The selected works by Maksim Bahdanovič have been published on the occasion of this Belarusian poet. It is the first comprehensive Czech translation of his poems, which significantly contribute to the understanding of the complicated historical fate of Belarusians in the last century. Maksim Bahdanovič (1891, Minsk – 1917, Yalta) died prematurely, at the age of twenty-five. In his lifetime, he published only one collection of poems, Vianok (A Wreath, Vilnius 1913). In spite of that, he is considered to be one of the founders of modern Belarusian literature. When he was only five years old, he lost his mother; he had a complicated relationship with his father; at the age of seventeen, he became ill with tuberculosis; he was not lucky in love – this made the poetic (but also critical, journalistic, translation and other) work that he left behind all the more remarkable and significant. He influenced all later generations of Belarussian authors and remains the most widely read classic of the Belarusian national revival period. The collection of Bahdanovič’s poetry has been organized, translated from Belarusian and provided with a commentary by Max Ščur. It has been recast in verse by Jan Frolík. The book has been published in cooperation with the International Civic Belarus Association. Distribution of the book is provided, besides the Slavonic Library, by online bookshop Kosmas.cz. The collection Můj milý, jdeš-li v létě Ruskem [My Dear, If You Are Walking Through Russia in the Summer] is the first book publication of Czech translations of the work of Dmitrii Alexandrovich Prigov (1940–2007), a Russian poet, artist and performer, one of the founders of Moscow Conceptualism, and a classic of the Russian cultural canon at the turn of the 21st century. The publication of the book has three objectives: 1) to present Prigov’s work in its exceptional genre diversity, from poetry and examples of extensive prose to smaller forms; 2) to attempt to mediate, in the form of a traditional book, the multimedia character of his production – he wrote and recited his texts as a performance, he was a writer and artist in one person, he created objects and installations, he intervened through his works in the public space; 3) to show his work from multiple perspectives – the collection is a result of cooperation between eight translators. This solution, which is editorially demanding, has made it possible for each participant to select from Prigov’s extensive work whatever was the most interesting and topical for him or her. The book is complemented by three scientific studies on Prigov’s work. Editor of the volume: Tomáš Glanc.